06/04/19 VAS machine collected from Depden and put up in Wickhambrook Road measuring outbound traffic. 30/01/19 VAS machine taken down, data analysed and published on this website. VAS machine now passed onto Ousden early due to holiday committments. 24/01/19 VAS machine taken down from Wickhambrook Road measuring outbound traffic, the data analysed and published on this website. Machine them put back in Wickhambrook Road measuring inbound traffic. 12/01/19 VAS machne collected from Depden and erected in Wickhambrook Road measuring outbound traffic. 16/11/18 VAS machine taken down from Bury Road, the data analysed and published on this website. Machine will be passed onto Ousden tomorrow. 07/11/18 VAS machine taken down from Bury Road measuring inbound traffic and the data analysed and published on this website. Now setup to measure Bury Road outbound traffic. 21/10/18 VAS machine collected from Depden and put up in Bury Rd measuring inbound traffic. 24/08/18 VAS machine taken down from Wickhambrook road, the data analysed and the analysis published on this website. The VAS machine will be passed onto Ousden tomorrow. 11/08/18 Data downloaded, analysed and results added to this website. VAS machine turned round now checking Wickhambrook Road Outbound Traffic. 30/07/18 VAS machine collected from Depden and put up in Wickhambrook Road measuring inbound traffic. 02/06/18 VAS machine taken down from Ousden Road, the data analysed and published. The machine has now be passed to Ousden. 25/05/18 VAS taken down from Wickhambrook Road, data analysed and added to this website. Machine now erected in Ousden Road for a trial period following an action taken from the Annual Parish Meeting. 12/05/18 VAS taken down from Bury Road, data analysed and machive put up in Wickhambrook Road measuring inbound traffic. 05/05/18 VAS machine collected from Depden and errected in Bury Road checking inbound traffic. 09/03/18 VAS machine taken down from Wickhambrook Road, the data downloaded and analysed and stats added to this website. The machine will be passed over to Ousden tomorrow. 24/02/18 VAS machine taken down from Bury Road, data downloaded and analysed. Machine now in Wickhambrook Road checking outbound traffic. 10/02/18 VAS machine collected from Depden and put up in Bury Road (North) checking outbound traffic. 15/12/17 VAS Machine taken down from Bury Road, data downloaded and analysed. Machine passed on to Ousden. 03/12/17 VAS machine taken down from Wickhambrook Road, the data downloaded and analysed and published on this website. It has now been errected in Bury Road (North) checking inbound traffic. 18/11/17 VAS Camera collected from Depden and put up in Wickhambrook Road (South) checking outbound traffic. 17/11/17 Speedcam Van in the Village, just down from the Village Hall around the midle of the day today checking outbound traffic. 22/09/17 VAS machine has been removed from Wickhambrook Road, the data has been downloaded and analysed and published on this website. The machine has now gone to Ousden so we won't have access to it for the next 8 weeks. 15/09/17 VAS machine taken down from Bury Road, the data analysed and added to the website. The data has been forwarded to the Police with a request for further speed checks in the Village. The VAS machine is now in Wickhambrook Road (South) measuring inbound traffic. 27/08/17 VAS machine back now and fitted on the post in Bury Rd (North) measuring outbound traffic. 01/07/17 VAS machine has been passed onto Ousden. 30/06/17 Machine taken down from Church Lane and the data analysed. 16/06/17 VAS machine has now been moved to Church Lane to gather data to understand traffic issues in Church Lane. The data from Wickhambrook Road has been analysed and added to this site. 15/06/17 Police car sited in Wickhambrook Road believed to be carrying out speed checks. 03/06/17 VAS machine back with us again and has been sited in Wickhambrook Road measuring traffic coming into the village. 08/04/17 Machine taken down from Bury road and passed onto Ousden. Data analysed and this website updated. 27/03/17 Machine taken down from Wickhambrook Road (Hargrave South Outbound) and moved to Bury Road. (Hargrave North Inbound) The results have been analysed and forwarded to our local Police Officers. They are also shown on this website as usual. 13/03/17 VAS machine now back in the village and has been erected at Hargrave South post checking traffic heading out of the village. We now have more interest from our local Police Officers who want to be kept up to date with the latest data so they can target the times and locations when most speeding takes place. 13/01/17 VAS machine taken down and the results analysed. The VAS machine now moves onto Ousden and we will not get it back for 8 weeks. The results have been published on this website and don't show any real signs of improvement. However the maximum recorded speeds at 65 - 70 mph is slightly lower than previous periods but we still have a long way to go to get speeds to an acceptable level. 29/12/16 VAS Speed machine has been moved to Bury Road, again checking traffic leaving the village. The data from Wickhambrook Road has been downloaded, analysed and the results have been published on this website. See links to the left for more detail. 01/10/16 The Police have deployed their own measuring equipment in the village and have verified our data so Hargrave is on the list for a visit(s) from the Speed Cam Van. 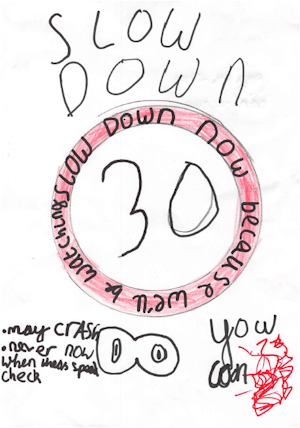 A competition was held for the children to design a suitable SLOW DOWN poster and this was won by Charlie Ambridge. 2nd prize went to Joshua Gilbert and 3rd prize to Zack Gilbert. All of the entries were very good so each entrant received a consolation prize. 01/09/16 Pressing the Police to get the Speed Cam Van to visit Hargrave having submitted considerable data. It now appears that the Police will need to verify the data by deploying their own measuring equipment before they will send out the Speed Cam Van. 19/05/16 Two Speed Cam vans have been purchased and will be deployed across Suffolk and Norfolk according to local data provided to them from VAS machines. More villages are keen to get in on the VAS initiative and it now seems that 4 machines will be shared between 12 villages. 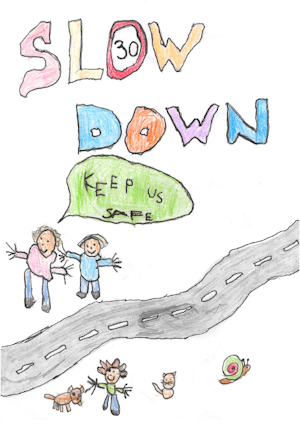 03/03/16 Moving ahead with the childrens competition to design a roadsign. Quotes obtained for producing a laminated A3 and A2 size notice. 05/11/15 Data being sent to local Police regularly. 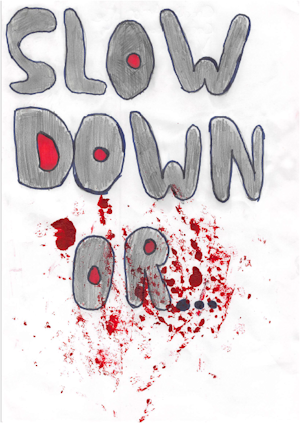 A suggestion that we get the children of the village to design a sign to persuade drivers to slow down was agreed. This would take thr form of a competition and Clive Pollington has agreed to fund this. 03/09/15 Analysis of the data has proved surprising and has shown that the extreme high speeds are happening during peak times like 75mph recorded between 5 and 6 pm on a Friday. All data to be forwarded to the local Police on a regular basis to enable them to target offenders. Some brightly coloured signs are being considered to place along the roadside, again to remind drivers that they are in a 30 mph limit. 02/07/15 Data from the 2 VAS machines is being collated and is providing useful information about the speed of traffic through the village. The ultimate obective being to provide data to the Police so that they can target their visits to the village with their speed gun at the times when most speeding is evident. 21/05/15 Report to the Annual Parish Meeting indicated that the fixing of 30 mph stickers to the black / grey bins appears to be having an effect. It was also reported that a VAS machine was currently in place on both of the new posts. The first weeks results show that around 50% of the 500+ vehicles per day that pass through the village are doing speeds in excess of 35 mph and would attract a speeding ticket if a Police speed trap was in attendance. 14/05/15 Events have overtaken recent plans and 2 VAS machines have been delivered to Hargrave who now have the posts erected and are ready to go. Mary Evans has arranged a meeting in Hargrave Village Hall on 28th May 15 for the 3 villages concerned. (Cowlinge, Hargrave and Gt Bradley) to arrange how these 2 machines should be shared when the other villages get their posts erected. 05/03/15 The posts for the VAS machine have been ordered and should be erected on 10/04/2015. A meeting was held between Hargrave, Cowlinge and Gt Bradley to work out a plan for deploying the VAS machine. These villages being the only ones that are close to getting the posts erected. Mary Evans has already purchased one VAS machine and a plan is required for sharing this machine. 15/01/15 Mary Evans has ordered and paid for 2 Speed Machine signs. The intention is to put these signs up when the VAS machine is not in our village. A meeting is to be arranged between Hargrave, Ousden, Depden and Wickhambrook to confirm the plans for the sharing of the VAS machine. Mary Evans suggested we combine this meeting with a chance to meet the manufacturers of the VAS machine to fully understand how they should be deployed and how the data can be extracted. 06/11/14 Correspondance still going back and forth with Highways trying to get the VAS project moved on. There are 2 proposed sites to locate the VAS signs: Opposite the Old Grove, Wickhambrook Road and near to Stonesthrow on Bury Road. It has now been agreed to purchase 2 posts from Highways at an approximate price of £150 which will be funded by the Parish Council. Negotiations are underway with Ousden and Wickhambrook with a view to sharing one VAS machine and splitting the costs. It is now agreed to move forward with the wheelie bin stickers. A4 size stickers (100) will be purchased will have a white background and the 30 mph roundel. These stickers will be provided to all residents along Bury Road and Wickhambrook Road where they will be seen by the majority of traffic. They should be stuck to the Black / Grey bins only so that every 2 weeks there will be a massive reminder to all drivers that they are in a 30 mph zone. We also requested the purchase of 2 Speed Machine signs to be used on the posts when the VAS is not present. 04/09/14 No news from Highways since their visit to the Village in July. The Officer responsible, Mr Anthony Smith, had not responded in any way until Mary Evans got involved and then a response was received. The VAS assessment has still not been done so we cannot process the request for the posts to be errected to mount the VAS signs on. Another idea put forward was to put up our own signs to try to reduce the speed of traffic through the village. It was also discussed that we should perhaps put stickers on our black wheelie bins to be a further reminder for drivers to slow down.